As any good editor will tell you, the process of editing is to put the film together to tell a story. We’re trying to tell the story as unobtrusively as possible, meaning that we’re avoiding “hard” cuts as much as possible. What’s a hard cut? That’s when the picture on your screen changes suddenly, jarring the audience out of the story while they figure out what’s going on. In order to prevent the jarring effect, we try to soften up the cuts with a few techniques. This is when you play the audio from one video clip underneath the next one that you’re changing to. 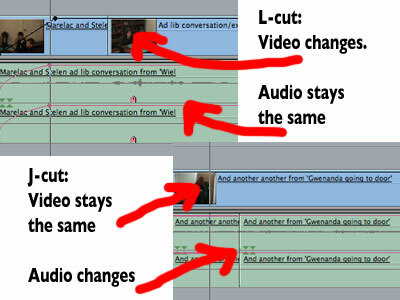 So I would take the video and audio of one clip, extend the audio without the video, and then drop my next video clip over the extended part of the audio. Opposite of an L-cut. You play the video longer, while the audio changes. This is my personal favorite. Maybe that’s because I discovered it on my own, without having to be told about it. If I have two angles of the same take, and I want to cut between them, I like to use a motion that somebody is making as a transition. Here’s how it works. Say I’ve got a group of people talking. One of them starts to move her head to look at somebody else. 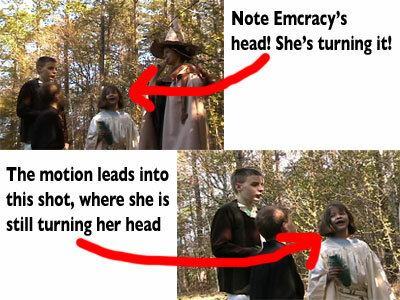 So on the first angle, I cut right when her head is halfway to where she’s moving to. On the second angle, I start where the first stopped. Tada! A virtually seamless cut, because the audience is following the motion. I know that some of you will probably just skim this article and say, “Oh, that’s nice.” However, I’ll bet you understand the complexity of editing a little better now. This entry was posted in Blog, Editing, Movies, Tips and Tricks and tagged Editing, isundae ii, j-cut, l-cut, motion, smooth cuts. Bookmark the permalink.